Wild Encounters | Dallas ZooHoo! 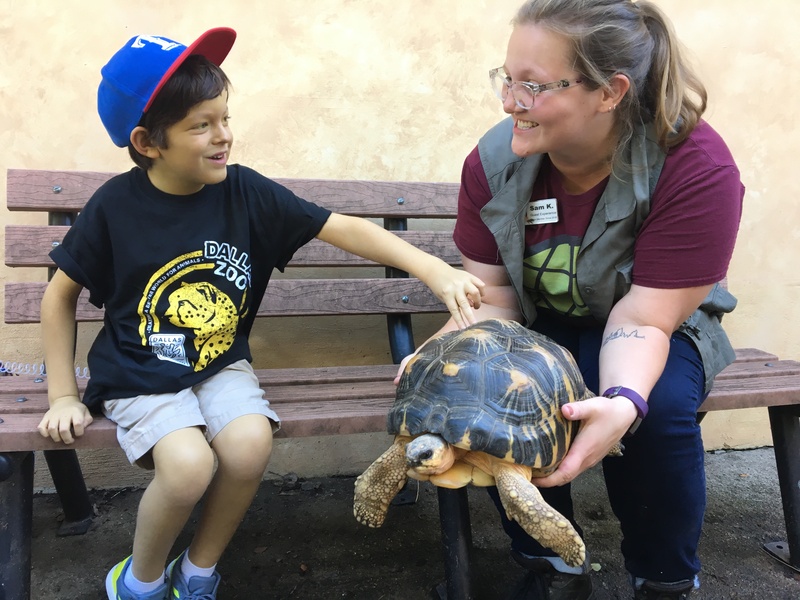 Posted on November 6, 2018 by Samantha K.
Sebastian meets Sunny the radiated tortoise behind the scenes at Wild Encounters. Animal Encounter Specialist, Samantha K. guest blogs on ZooHoo! Like all staff at the Wild Encounters stage, I see many different faces each day. I always find it incredibly special when I start to recognize the faces of members who come to the zoo a few times a week, or those Zoo patrons who stay at the stage for multiple shows in a row. A young man named Sebastian was one of the first special patrons I began to notice time and again at the Wild Encounters stage. He was always so enthusiastic, had the best questions to ask me, and seemed to absorb every word I said. He even requested for me to give a presentation or two before the start of the summer months! I really did not see much of Sebastian during the hot season and missed his enthusiasm. He and his mother returned to the Zoo about a week ago, much to my delight. During this visit, I was able to find out a little bit more about why they had been gone during the summer. 6-year-old Sebastian has a very rare and severe case of Hirschsprung’s Disease. It affects his pancreas, liver, large and small intestines, causing him to be on many transplant lists. 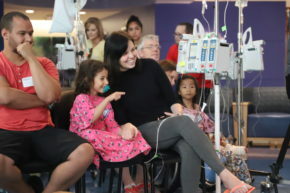 Sebastian is often seen carrying around a backpack that administers his medications, which is one of the reasons I was quickly able to recognize him every time he came to the stage during his visits. When we learned about his condition, we wanted to give him the opportunity to learn even more about the animals he sees when he comes to the stage, and to get up-close and personal. Sebastian and his mother with Sam K. and Ziggy the eagle owl at the Wild Encounters stage. Sebastian, along with his mother and grandmother, came back to the Zoo a couple of days later and we were able to treat him to a behind-the-scenes experience in our VIP area. Sporting his awesome cheetah conservation shirt, Sebastian was able to learn all about some of the amazing animals often featured on the Wild Encounters stage. 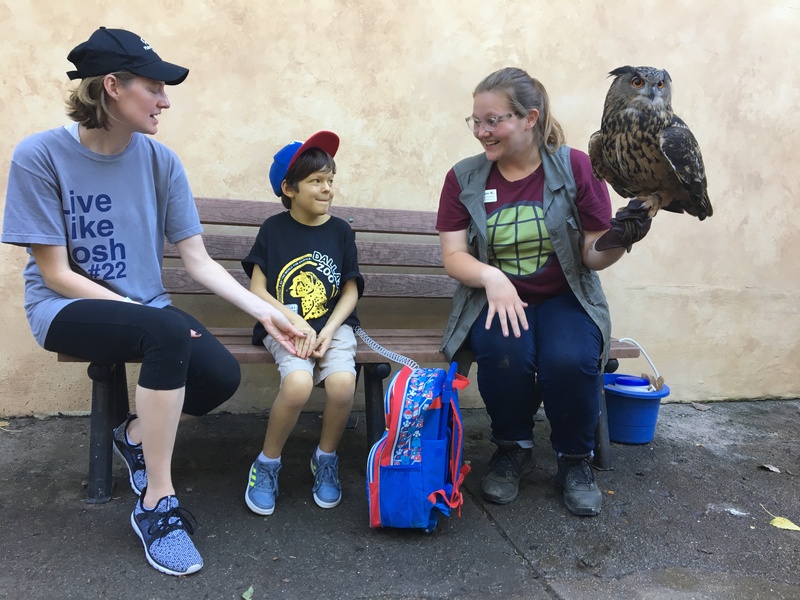 He met Indy the savanna monitor and learned about their amazing tongues, Ziggy the Eurasian eagle Owl and their large size, and one of his personal favorites, Sunny the radiated tortoise. We complimented his choice in attire, and he said that his mom told him he could purchase one thing while visiting the zoo, and he picked the cheetah shirt for conservation! 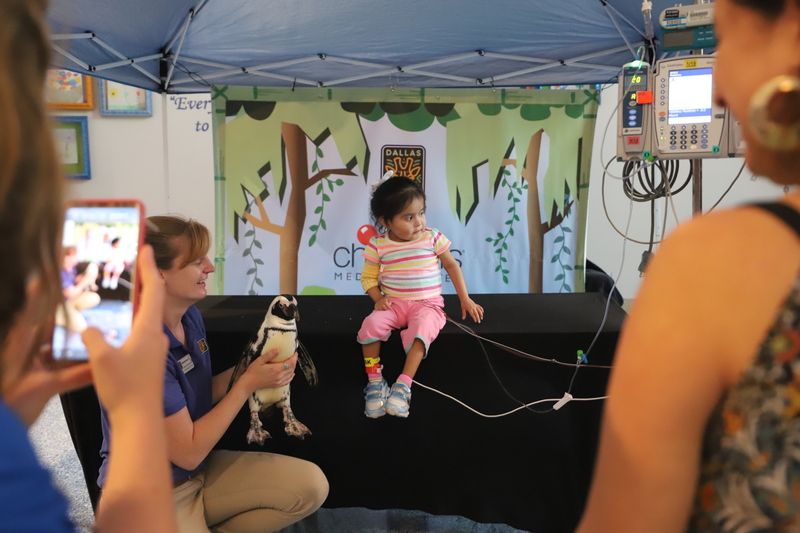 It was an incredible opportunity to connect with someone and make a difference in their lives by doing what I love to do here at the Dallas Zoo. I learned more about Sebastian that day, and I am happy that he’s not just another face in the crowd. We always hope to impact our visitors every day with how they can create a better world for animals, but they might not realize just how much they impact us, too.